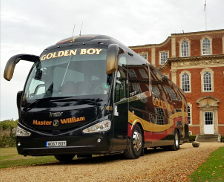 Golden Boy Coaches first took to the road in 1968 and is still owned and managed by the same family. 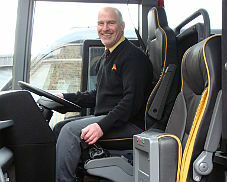 Over the decades the company has grown in size and has earned an enviable reputation for providing high quality coach hire. Golden Boy Coaches has an excellent reputation for customer service. From your initial enquiry our expert coach hire booking team can provide you with an accurate quotation and advise you on any other aspects relating to your coach hire. Our coach hire operations and maintenance team are on duty twenty-four hours a day. On the day of hire you are sure to be looked after by one of our many experienced drivers who will make your journey with us as enjoyable as possible. Our drivers are proud to wear the company uniform and for your reassurance have been DBS checked to an enhanced level. Their aim is to make your time travelling with us as enjoyable as possible. The company operates from two purpose built depots in Hoddesdon, Hertfordshire. Only ten minutes away from junction 25 of the M25 we are ideally situated to provide luxury coach hire and minibus hire to London, Hertfordshire, Essex, Stansted Airport, Luton Airport and Heathrow Airport. We offer a range of coaches from standard through to executive class, which are fully equipped with drinks machines, washrooms, air-conditioning, Wi-Fi, DVD/CD player, and tables - in fact everything for your added comfort. Our vehicle seating capacities range from 16 to 19 seats in our minibus fleet and 29 to 33 in our midi fleet. Our largest coaches can carry 53 or 57 passengers and our high capacity 70 seaters are ideal for school groups. 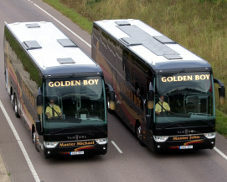 Golden Boy Coaches is always looking to the future and as part of that, the company has a policy of ongoing investment in vehicles. Therefore, our fleet of vehicles is continually being updated to ensure that our quality of service is maintained. Seating capacities and facilities change as the market demands; however, we are committed to ensuring that a range of coaches to suit all needs is available. As a specialist coach company, you can be sure that we will fully understand and accommodate all of your requirements. We do not operate excursion programmes, instead we concentrate all our resources on tailor made coach services. Whether your requirement is for a regular service, a “one-off” hire, a multiple hire involving numerous vehicles, a French day trip or a two-week tour, then we’re the people to talk to. Learn more about Golden Boy Coaches on our company website.